As of December 9, Vauxhall’s Ellesmere Port factory had assembled 5 million of the British automaker’s cars. Ellesmere Port first began producing the Viva compact car after opening in 1964 and has been responsible for assembling Vauxhall’s compacts ever since, building the Chevette and three generations of Astra. When Vauxhall celebrated the start of Vivaro production at its plant in Luton, UK, they hired precision driver Paul Swift to pull some drifts and handbrake turns in the LCV inside the plant. Now, to celebrate the 5 millionth car rolling off Ellesmere Port’s production line, the automaker has once again taken to driving its cars indoors. This precision driving display is the work of one Ellesmere Port worker known only as “Ellesmere Pete.” He’s apparently been driving Vauxhalls rather aggressively since the 1960s, and has been known to grab an Astra or three and launch it into the air off a ramp, or do a half circle of the plant on two wheels, the automaker jokes. Ellesmere Port employs a workforce of about 1800 people and is capable of putting out a new car every two minutes. The plant is currently retooling and looking to hire an additional 300 staff in order to accommodate production of the 2015 Astra, part of a £140 million investment from General Motors. The new Astra will hit the market early next year, with Ellesmere Port being the lead manufacturing location for the car for all of Europe. 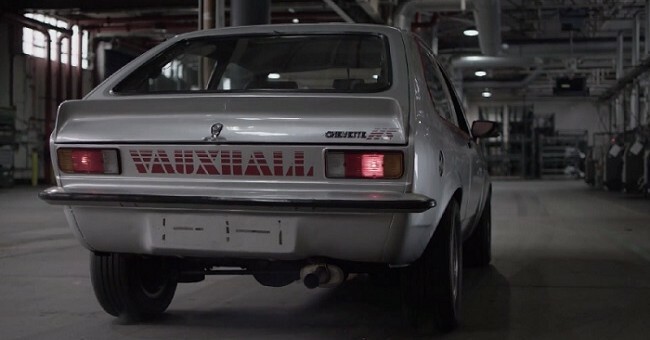 In the meantime, watch Ellesmere’s resident racing driver hoon historic Vauxhall legends around the plant, including a 1980 Chevette HS2300, an MK3 Astra GSi and many more. Hope the short clip will be put on TV, it’s a great lively clip & watched over & over is still enjoyable.